The results for each business and the state of affairs in each business unit will be explained from this slide on. First, the Office Business. 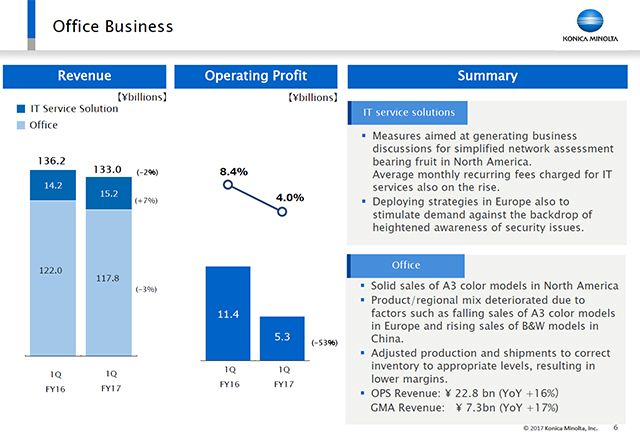 Revenue in 1Q was ¥133.4 billion and operating profit was ¥5.4 billion. Revenue fell very slightly by 2% year on year, but operating profit declined by 53%. The primary cause of the fall in profits was a decline in sales in Europe, but this and the outlook for 2Q and beyond are summarized in the next slide, so I will explain this later. MFP sales were solid in North America and color models expanded at double-digit rates year on year. In addition, sales in China have remained robust since last year. The focus areas of OPS and GMA continue to expand steadily. With our relationships of trust with European customers as our starting point, we won several projects in which the scope of the contract expanded to other regions, such as Asia-Pacific. The strength of our direct sales in Europe and the depth of our support capabilities are contributing to global sales. Also, we have won projects at a major automotive-industry manufacturer even in China. In China we also won several GMA projects at a major communications company last year, and I would like to emphasize that we have improved not only our ability to grow unit volumes, but also our proposal capabilities. IT Service Solutions also expanded. Corporate awareness of security concerns is rising globally, as seen in such initiatives as the strengthening of personal information management scheduled for FY2018 in Europe, and we have made effective use of this tailwind to grow our project generation activities.